Ngāti Whakaue is named for our ancestor, Whakaue Kaipapa. Whakaue was a recognised and well respected leader amongst his people. He was a direct descendant of Tamatekapua through his father Uenukukōpako. He was also the father of many tupuna who themselves have iwi named after them such as Ngāti Rangiwewehi, Ngāti Ngāraranui and many others. 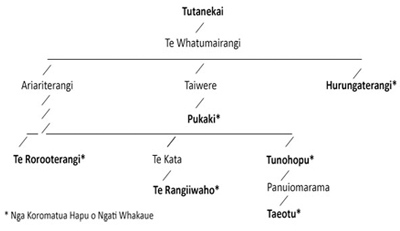 However, our links to Ngāti Whakaue connect more closely with the youngest son of Whakaue, Tutanekai and his descendents. Ko tēnei te whakapapa o Tutanekai rātau ko āna uri, arā, ngā tūpuna o ngā hapū Koromātua o Ngāti Whakaue e mohiotia ana inaianei. Ngāti Whakaue live on the beautiful southern shores of Lake Rotorua and around the Maketu region of coastal Bay of Plenty. We, the uri of Ngāti Whakaue, share our blood, our links, our whakapapa from these tupuna. Mauri ora!